Including jackets, coats, blouses, and skirts. 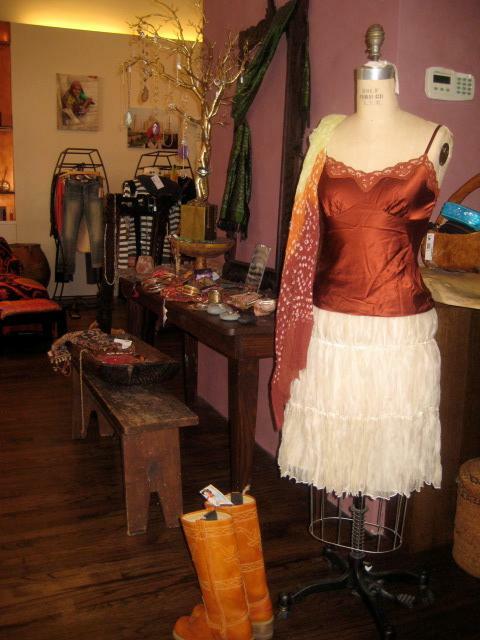 Last opportunity for Putumayo clothing. After this, there's no more! Cheers to the end of an era and to new beginnings. We're changing, and smiling, & growing more into ourselves. Wear your Awareness - or gift it ... or showcase for holiday photos ... !! Transformation Wear founder and good friend of ours, David McGee, is a master craftsman and enthusiastic entrepreneur. He is committed to a conscious, joyful existence, and to the advancement of "a new earth." A new earth is emerging as more and more people choose to bring joyful awareness into the world, and to use whatever they do as a vehicle for consciousness. David founded Transformation Wear as such a vehicle; one that also reflects his commitment to sustainable living and his belief in the law of least effort. After all, the nature of nature is transformation, and nature transforms with effortless ease. Grass doesn’t try to grow; it just grows. And caterpillars naturally change into butterflies because that was their hidden purpose all along. David believes we should align our intelligence with nature’s by living green, practicing simplicity and valuing ease. A simple change of shirts affects positive change. Now how easy is that? Pop into Seeking Indigo to see the new collection for infants and youngsters alike! Matching shirts for the mom and dad are available as well. Choose a word. Wear it comfortably. Live it effortlessly. Spell it out and make it happen – one shirt at a time. New Seeking Indigo Collection as featured at Charleston Fashion Week has arrived! Our exclusive new collection of dresses featured on the runway at Charleston Fashion Week have just arrived at Seeking Indigo! Perfect for that summer wedding or alfresco dinner downtown. Check out the rich, romantic and stylish new collection today. Seeking Indigo is located 445 King Street in the Upper King Design District. Jennifer sure knows how to make something look fabulous!!! Seeking Indigo has the perfect hat for any occasion. Get ready for the beach or that Kentucky Derby Party. A must have for this spring and summer! Seeking Indigo debuts new line at Charleston Fashion Week this Thursday! Get your tickets now!!! Seeking Indigo rocks the runway at Charleston Fashion Week this Thursday March 18 at 9:00 PM. The new Seeking Indigo label will be launched along with exclusive collections from Kavita Bharati, Chan Luu and many more. This is one show you don't want to miss!